The holistic chef was the only reason why I stayed for almost 7 hours at this "media launch." It was a grueling "information overload to the max" for the rest of the talks composed of several information about their products. She also patiently waited for her to talk and demo what we could call her advocacy to promote health and wellness by offering vegan alternatives to our favorite meals. It was just a shame that having an absolutely meatless meal is not possible since she was referring to a need by children to still have meat to get the necessary nutrition needed by their young bodies. But for the adults, we may make it past our prime if a great percentage of our diet is fruits and vegetables. No more fast food, or the so called junk food or "chicharya." No more MSGs or similar harmful ingredients. Real chefs don't use msg or anything related like instant flavoring powders, cubes, granules, etc.. Chefs are supposed to be able to bring out the flavor of dishes using natural spices and ingredients. They should be both artists and scientists of the kitchen. Food should not only look good, but also taste good without using anything artificial. 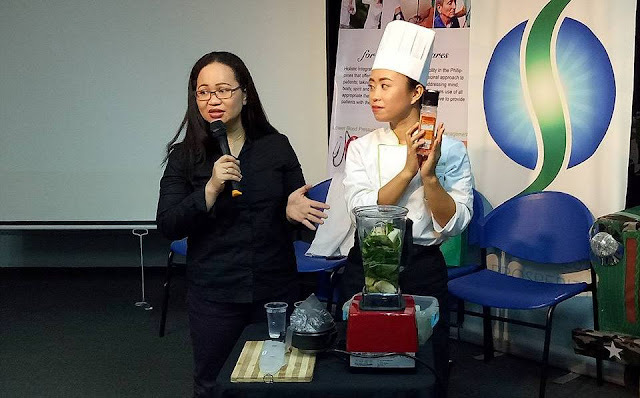 Her demo on smoothies by mixing fruits and veggies using a special kitchen equipment would make you want to buy the machine so you could start living a life having no need for medicines. But you could do the next big thing using any ordinary blender for food processor. She was also responsible in preparing the meals we ate that night composed of noodles, veggie kebab, veggie maki, lemongrass or "tanglad" for drinks, and "turon" for dessert. Honestly, I only liked the "turon" among the lot since the tongue still needs to adjust before it would agree with the sudden change. Our food craving is based on what we usually eat making it our comfort food. Getting used to new things like a plant-based diet would require patience and time. I remember the last time I visited HICC and that was where they let me taste the meals (some pasta and rolled veggies) prepared by he Holistic Chef, and I distinctively recalled I enjoyed them. We've been trying to keep healthy similarly. We even bought juicers, arranged for diet meal deliveries, fell in line to use gym facilities, underwent fat reduction at specialty clinics, and other similar stuff all aimed to make us look and feel better. Doctors will run out of jobs if we can relieve ourselves naturally using whatever nature could provide. Pharmaceutical companies would run out of business because there won't be the need for even generics. ..and this may even threaten clinics and health centers since if nobody will be sick, there won't be the need to cure. However, our mistake is thinking these medical facilities were only meant to cure. We should embrace the fact that it could very well be there to keep us healthy. It should not be there as just a place to operate, remedy, or recuperate. It should be better as a venue that would make sure sickness or disease would not get the chance to go near us. The combined Holistic Integrative Care Center (HICC) and Stemtech awareness launch for their esteemed products and services. HICC is a medical facility that offers revolutionary and multi-dimensional approach to clients using the “Future of Medicine – Integrative Medicine” treating chronic degenerative diseases. Stemtech, on the other hand is all about stem cell nutrition. Their products do not contain stem cells but are said to be made from quality ingredients that were not specified during the event.Their products aim to make our stem cells healthier by contributing to the natural renewal system of the body and allowing better blood circulation for noticeable effects like a youthful skin and optimized health. The 2017 corporate campaign aims to bring the goodness of life and "healing that cares" to every household nationwide. The official TVC and Jingle was also launched that night. "Wow! I learned a lot! Being healthy does not mean the absence of disease. Being healthy means that one achieved a balance of everything. Staying healthy as you age! Spending more time to the things you love to do or with your love ones rather than wasting it by staying at the hospital or at home bed ridden. Invest on your health today or spend your money to hospital bills and medicines. Thank you so much to Holistic Integrative Care Center team specially to Dr Meddie Edodollon (Medical Director), Mr Jasper John Tan-Maguigad (PR & Communications Manager) and Chef Arlene Clemente, and to Stemtech specially to Mr Percival Estrella (Director) and Ms Cynthia cendeno (Business Development Manager). Just like what Dr. Meddie Edodollon said, start with the food on your plate. Healthy aging! Happy aging!" 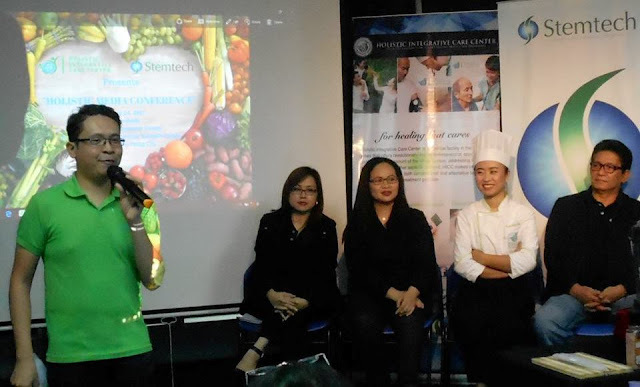 Stemtech Philippines was launched last September 19, 2009 as a branch of Stemtech International, Inc. in Florida, U.S.A. More than a thousand distributors, local and foreign gathered and witnessed the event graced by Stemtech CEO Ray Carter. The event proved to be a success with the signing up eventually of more than 2000 distributors in the next year to come. The office is well supported with an excellent computer system that allows our distributors to do remote business transaction from ordering to checking their genealogy. At Stemtech, we do not sell our products in stores. Instead, we pay Independent Business Partners – people just like you – to help share our products and income opportunity with others. Our global Distributor team includes people from all walks of life – students, doctors, retirees and at-home parents alike enjoy the benefits of the Stemtech opportunity. More and more Filipino began to benefit from StemEnhance and many also enjoyed the extra earnings as a business partner. Their amazing stories are widely varied from clarity of mind to cardiovascular health and many others. This just shows how Stemtech changes lives and how Stem Enhance improves the quality of life. With the popularity of Stem Cell Theory, many broadsheets begin to write about this putting StemTech in the limelight. Time for a Haircut? Check Out Sports Barbers! Is the President of the Philippines a Murderer?